Melt butter slowly in pan. Add crushed crackers, bread crumbs, garlic, and cook slowly until heated through. Remove bread crumb mixture and place in large bowl. Add crab meat, shredded cheese, Worcestershire sauce, sherry and parsley. Cut open the lobster by inserting your knife just underneath the head and the cutting down, splitting the belly (body and tail). Remove the “inners” but not meat or roe. Rinse lightly under cold water. Place the lobsters flat on a heavy, large foil lined baking sheet. Stuff the lobster’s opening, top and tail with the crabmeat stuffing. Place the stuffed lobster, belly-side-up in pan. 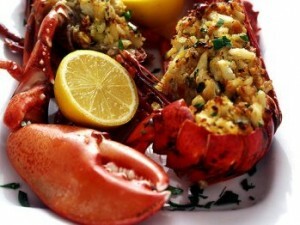 Squeeze fresh lemon juice and dot slices of butter over the top of the lobsters. Bake until the lobster is cooked through and the stuffing is crisp and golden. Bake 17 minutes for 1 1/2 pound lobsters and 24 minutes for 2-pound lobsters. Eat immediately so lobsters do not dry out. Serve with drawn butter for dipping.